This article is about the year 1707. 1707 (MDCCVII) was a common year starting on Saturday of the Gregorian calendar and a common year starting on Wednesday of the Julian calendar, the 1707th year of the Common Era (CE) and Anno Domini (AD) designations, the 707th year of the 2nd millennium, the 7th year of the 18th century, and the 8th year of the 1700s decade. As of the start of 1707, the Gregorian calendar was 11 days ahead of the Julian calendar, which remained in localized use until 1923. In the Swedish calendar it was a common year starting on Tuesday, one day ahead of the Julian and ten days behind the Gregorian calendar. Wikimedia Commons has media related to 1707. April 25: Battle of Almansa. 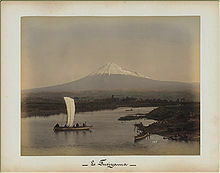 December 16: The last recorded eruption of Mount Fuji begins. January 1 – John V is crowned King of Portugal and the Algarves in Lisbon. January 16 – The Treaty (or Act) of Union, of the two Kingdoms of Scotland and England, is ratified by the Parliament of Scotland. March 3 – Emperor Aurangzeb dies in Delhi. March 19 – The Act of Union with Scotland is ratified by the Parliament of England. April 25 (April 14 Old Style) – War of the Spanish Succession – Battle of Almansa: The Bourbon army of Spain and France (with Irish mercenaries) under the French-born Englishman James FitzJames, 1st Duke of Berwick, soundly defeats the allied forces of Portugal, England, and the Dutch Republic led by the French-born Huguenot (in English service) Henri de Massue, Earl of Galway. Following this, Philip V of Spain promulgates the first Nueva Planta decrees, bringing the Kingdoms of Valencia and Aragon under the laws of the Crown of Castile. May 12 (May 1 Old Style) – The new sovereign state of Great Britain comes into being, as a result of the Acts of Union, which combine the Kingdoms of Scotland and England into a single united Kingdom of Great Britain, and merge the Parliaments of England and Scotland, to form the Parliament of Great Britain. May 23 – Volcanic eruption in the Santorini caldera begins. July 29–August 21 – War of the Spanish Succession – Battle of Toulon: The Allies are obliged to withdraw, but the French fleet is effectively put out of action. October 22 – Scilly naval disaster: Four British Royal Navy ships run aground in the Isles of Scilly, because of faulty navigation. Admiral Sir Cloudesley Shovell and at least 1,450 sailors all drown. October 23 – The Parliament of the Kingdom of Great Britain first meets in London. October 28 – The Hōei earthquake (the most powerful in Japan until 2011) strikes, with an estimated local magnitude of 8.6. November 30 – War of the Spanish Succession: The Siege of Pensacola ends, with the Spanish successfully defending their fort. December 16 – The last recorded eruption of Mount Fuji begins in Japan. December 24 – The first British Governor of Gibraltar, directly appointed by Queen Anne, Roger Elliott, takes up his residence in the Convent of the Franciscan Friars. December – Charles XII of Sweden launches his campaign to conquer Russia, marching to the east from Leipzig with 60,000 coalition troops. Another 16,000 soldiers are waiting on the outskirts of Riga, guarding the Swedish supply lines. A fortress is founded on the future site of Ust-Abakanskoye (modern Abakan). The Lao empire of Lan Xang officially ends, and splits into the kingdoms of Vientiane, Luang Prabang, and Champasak. Hacienda Juriquilla is built in Querétaro, Mexico. ^ Payne, Stanley G. "Chapter 16: The Eighteenth-Century Bourbon Regime in Spain". A History of Spain and Portugal. 2. Madison: University of Wisconsin Press. ISBN 0-299-06270-8. Retrieved 2008-04-17. ^ Acts of Union 1707 parliament.uk, accessed 31 December 2010. ^ Williams, Hywel (2005). Cassell's Chronology of World History. London: Weidenfeld & Nicolson. p. 291. ISBN 0-304-35730-8.